Toukiden is a third-person monster hunting video game released in June 2013 for the PSP and PSV. 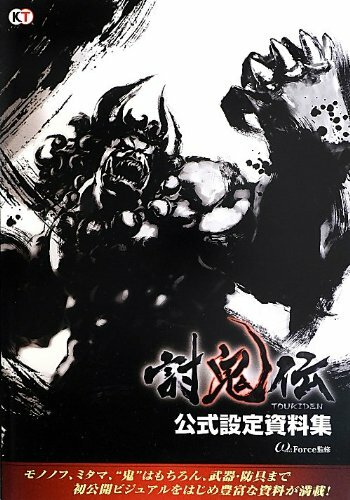 討鬼伝 公式設定資料集 (Toukiden Official Setting Guide) is the visual companion guide to the game. It's a 256-page paperback. The size is between A4 and A5. It features designs for the characters, monsters, weapons and armor. At the back are commentary into the world, environment and miscellaneous art. The designs are a mixture of in-game 3D models and concept art. The character designs are quite similar to those you would find in Japanese feuding war period video games, such as Sengoku Mosou 3, Suikoden and Sengoku Basara. It's a Japanese game so you can expect Japanese style flowing dresses, armor and coat. Monster designs are pretty cool and look like they could come from The God of War but different in the sense that they are not inspired by mythological creatures. The details are amazing, but the 3D models are rendered a bit dark and some details are lost in the shadows. The third chapter has character profile artworks and descriptions of what seems to be non-playable characters. There are 103 of them. Weapon and armor designs are very typical of games in this genre. They are nice designs but it would be difficult to pinpoint exactly which game they come from if you show them to anyone without reference. The environment art pieces are beautiful but they are game screenshots and not printed very big. Highlight of the book would be the creature designs. I just wish there were more or printed bigger.